Ram arrives at the 2017 Houston Auto Show with updates for its pickups that should appeal to meat eaters and the style conscious. Delmonico Red is a new no-cost color choice for the Ram 1500 Rebel, and customers can start getting the blood-tinged shade in May. The tone takes its name from a well-known 19th century restaurant in New York and the cut of steak that the place is famous for inventing. The deep crimson tint is reminiscent of the color at the center of a medium-well hunk of beef. Depending on the angle that light hits the truck, the hue can look bright red or take on a burgundy hue. Buyers can choose to have Delmonico Red cover the whole truck or get it with a two-tone appearance that adds black lower panels. The Rebel Black optional package would also affix dark components for the wheels and front skid plate. 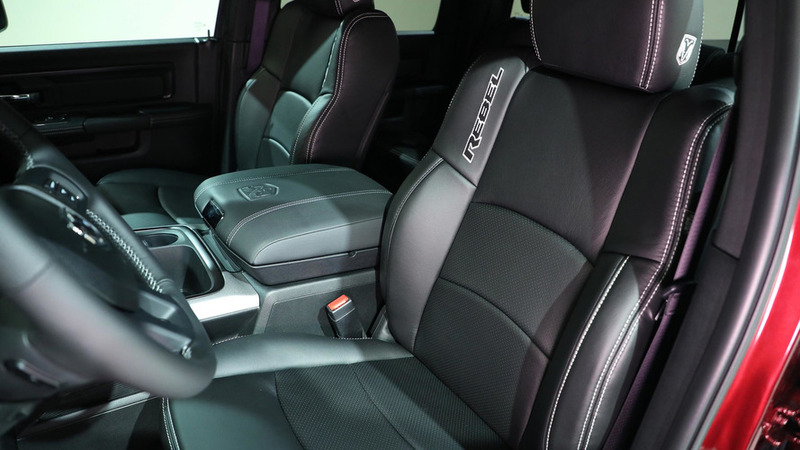 Inside, the Ram Rebel in Delmonico Red comes standard with black upholstery and gray accent stitching. The cabin also includes dark anodized trim for the doors, center console, instrument panel, and gauge cluster rings. Ram is also using the Houston show as an opportunity for unveiling new styling options for the range-topping Limited trim of the 1500, 2500, and 3500 pickups. People who prefer a more understated appearance can choose to have the same color as the rest of the body for the R-A-M lettering across the tailgate and for the side steps. Currently, these parts are only available in bright chrome. The Limited trim starts at $54,270 on the 1500, $59,170 on the 2500, and $60,270 on the 3500. The new body color options add $195 each for the tailgate and running boards, and buyers can start getting these less flashy additions starting in May. Body-color running boards are also now available on the Ram 1500 Night model. The addition lets this truck’s black trim pair with more monochromatic elements on the body. April 5, 2017 , HOUSTON - Ram Truck today unveiled updates to two of its leading model lines; the 2017 Ram 1500 Rebel and Ram Limited. For 2017, Ram will add a seventh color option for the brand’s 1500 off-road model. The Ram Rebel 1500 Delmonico Red joins Bright Silver Metallic, Bright White, Brilliant Black, Flame Red, Granite Crystal Metallic and Mojave Sand. Ram also announced that the most premium members of the Ram pickup truck lineup -- Ram Limited models -- will be available with new body-colored R-A-M tailgate letters and side steps, replacing chrome tailgate letters and side steps. The Rebel Delmonico Red is a new no-charge addition to the Rebel family of colors. The deep red exterior color is available in all Rebel models and two-tone (black lower panels) or monotone paint treatments. Ram 1500 Rebel Delmonico Red can also be ordered with the Rebel Black (black wheels and front skid plate) appearance package. 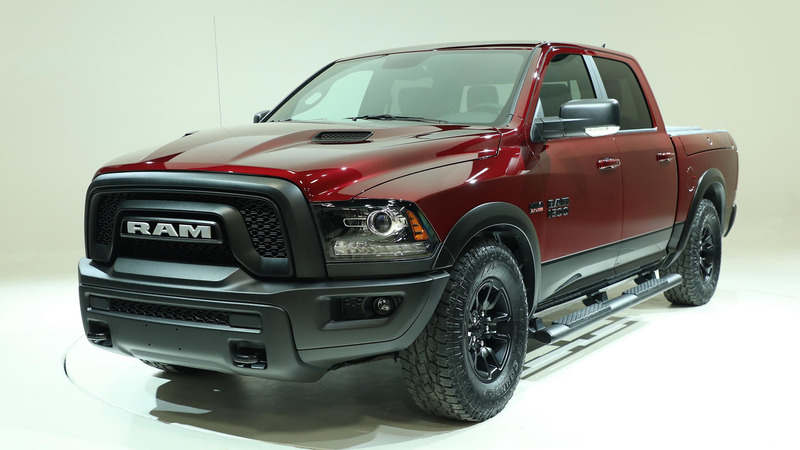 Ram Rebel Delmonico Red features a black and gray interior with black anodized bezels on the doors, center console, instrument panel and gauge cluster trim rings. All-black heated seats with black “Rebel” embroidery are highlighted by Light Slate Gray accent stitching, which also traces the instrument panel, center console lid, doors and seats. Deep rubber floor mats capture snow and mud. The Ram Rebel Delmonico Red starting Manufacturer’s Suggested Retail Price (MSRP) is $45,095 plus $1,395 destination. Orders are open now and Delmonico Red Rebels will start arriving in dealerships in May 2017. Also announced, Ram 1500, 2500 and 3500 Limited trim pickups can now be ordered with monochromatic R-A-M tailgate letters -- including Bright Silver Metallic, Bright White, Brilliant Black Crystal, Delmonico Red, Granite Crystal Metallic, Maximum Steel Metallic, Pearl White and True Blue. The new letters offer an alternative appearance option from the standard bright chrome letters introduced last year. 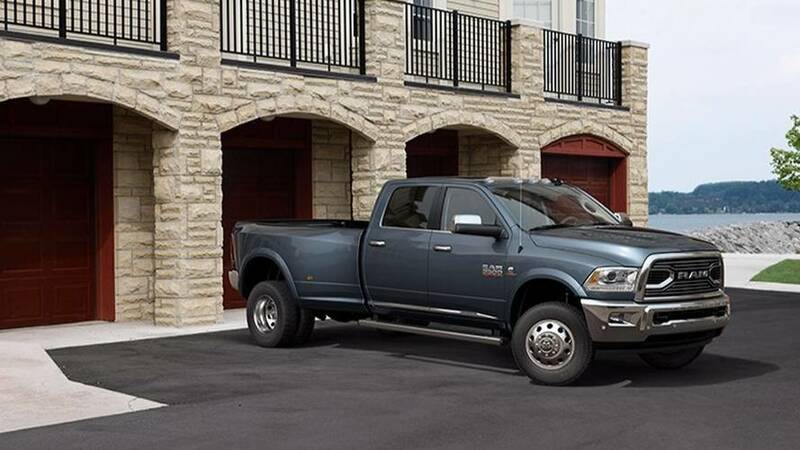 Ram 1500, 2500 and 3500 Limited models are also available with new body-colored cab-length running boards. These new running boards enhance the smooth monochromatic exterior appearance when paired with the body-colored tailgate lettering. The Ram Limited with monochromatic appearance package MSRP starts at $53,265 plus $1,395 destination, and will start arriving in dealerships in May 2017. Body-colored R-A-M tailgate letters and running boards are currently available for ordering and are priced at $195 each, when ordered separately. Ram 1500 Night editions in Bright Silver Metallic, Bright White, Brilliant Black and Granite Chrystal will also be available with body-colored running boards. Ram 1500 Night starting MSRP with the running boards is $38,885 plus $1,395 destination. exclusive air suspension in order to offer increased ride height. New front grille design and “R-A-M” branding offer a new styling signature for Ram Truck. Rebel is also distinguished by unique interior colors and materials, including Radar Red and Black seats with tire tread-matching patterns. The Ram 1500 Rebel is available in three short wheelbase Crew Cab configurations with a standard 4x4/3.6-liter Pentastar V-6/TorqueFlite 8 combination, delivering 305 horsepower and 269 lb.-ft. of torque; a 4x2 5.7-liter HEMI V-8 with variable valve timing, fuel-saver technology and 395 horsepower/410 lb.-ft. of torque mated to a TorqueFlite eight-speed transmission 4x2; or HEMI-powered 4x4. Ram Limited takes the Ram truck line to the highest level of sophistication and attention to detail. Featuring premium materials, such as all-black, full-leather seating; real wood interior components; and unique badges, Limited is a “black-tie” luxury complement to the popular southwestern-themed Longhorn edition pickup. The Limited’s grille is the truck’s most prominent exterior distinction. As the leading point, its billet port grille breaks from the long tradition of crosshair styling with bold “RAM” lettering. Limited also features a bolder “RAM” tailgate design and all-new 20-inch forged multi-surface aluminum wheels – unique in the truck market. Inside, subtle stitching accents, pin-striping, unique materials and patterns are found throughout the interior. A deep console bin houses a cellular phone and tablet holder, which can be concealed with a tambour wood sliding door. The genuine wood door is made from Black Argento wood. Ram 1500 Limited includes as standard equipment a Ram-exclusive Active-air suspension system with five settings: entry/exit, aero mode, normal ride height, off-road 1 and off-road 2. Ram owners enjoy a best-in-class Uconnect connectivity system with WiFi hotspot and voice-to-text capability. Also new for 2017 Ram 2500 and 3500 Heavy Duty Laramie, Longhorn and Limited models is the 6.4- liter HEMI V-8 as standard equipment, delivering best-in-class gas towing capacity of 16,320 pounds. Ram Heavy Duty Longhorn and Limited 4x4 models also come with Bilstein monotube shocks, enhancing their already best-in-class ride and handling.